The daughter of farmers, Wangari Maathai has never strayed far from her ancestral roots. She has steadfastly advocated justice for the poor and disadvantaged while also protecting the earth's natural resources. The keynote speaker at the 2007 Esri International User Conference, Maathai spoke of her life's work and the important role GIS technology is playing in it. Maathai has achieved many firsts in her lifetime. She was the first woman in east and central Africa to earn a doctoral degree. When she became chair of the Department of Veterinary Anatomy and an associate professor at the University of Nairobi, she was the first woman to do so. Likewise, in 2004, she became the first African woman to receive the Nobel Peace Prize. During her keynote address, Maathai discussed the significance of her selection for the Nobel Peace Prize and the importance of civic and environmental education. In 1977, responding to the needs of women in Kenya's rural areas, Maathai founded the Green Belt Movement (GBM). 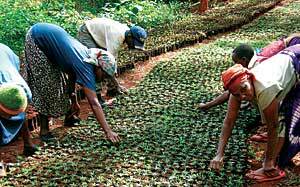 An environmental group, GBM helps restore indigenous forests and assists women by paying them to plant trees in their communities. The group has since planted more than 30 million trees and expanded its work internationally to include not only tree planting but also environmental consciousness, local biodiversity, civic education, and self-empowerment. Maathai connected the dots between deforestation, soil erosion, lack of drinking water, and poverty. These, she determined, led to a corrupted system of government, and bad governance contributes to the destruction of resources. The forests are cleared through illegal logging, resulting in soil erosion. Maathai clearly saw how these environmental issues were linked. "Part of the campaign to rehabilitate the land also became the campaign to regain our rights, to regain our dignity, to regain our respect, to hold our leaders accountable so that they won't impoverish us," she said. Along with teaching women how to plant trees, she began to show them ways to participate in government. She had numerous confrontations with Kenya's ruling party and was arrested and beaten. GBM risked being outlawed, but Maathai prevailed, and in 2002, she was elected to Kenya's parliament and subsequently appointed as Assistant Minister for the Environment. Maathai said that with her Nobel award, the Nobel committee was trying to "shift our thinking about peace and security." She said the committee was sending a message "that for us to live in peace with each other, it is necessary for us to manage the limited resources on this planet responsibly, accountably, and that it is very important for us to share these resources more equitably." Maathai explained that much of the country's water supply and electricity is derived from the rivers emanating from mountain forests. GBM is seeking to protect and rehabilitate these forests, and GIS technology is helping show the effects of deforestation over time and delineate areas in need of tree planting. Maathai explained that the visualization capabilities of GIS technology has enabled government leaders to clearly see where the forests need restoration and provide support for that work. During Maathai's address, Peter Ndunda, a GIS specialist with GBM, presented some examples of the group's use of GIS technology and GPS devices to do basemap surveys and periodic site monitoring. Besides identifying threatened areas, Ndunda explained that the GIS software is also helping GBM monitor and validate its biocarbon projects. The group has developed a prototype application for its carbon sequestration project, which provides information about employment creation, income generation, the project's contribution to poverty alleviation, and the total carbon credits from these projects. More than just planting trees, GBM is working toward achieving the United Nations' Millennium Development Goals, which are aimed at easing human suffering and developing sustainability. Additionally, GBM is a sponsor of the United Nations Environment Programme's Plant for the Planet: Billion Tree Campaign. The objective is to plant one billion trees worldwide in 2007. To date, that target has been exceeded. Maathai encouraged people to participate by going to the GBM Web site (www.greenbeltmovement.org) and making a pledge. Maathai concluded her remarks by sharing some ideas with the audience about what to do to get involved. She talked about her Three R Mottainai Campaign. Mottainai is a Japanese term that can mean "Respect resources; do not waste resources." She is encouraging people to think of ways to produce products from recycled materials. Maathai said that we are all called to do "the best we can for as long as we live." For more information about GBM, visit www.greenbeltmovement.org.